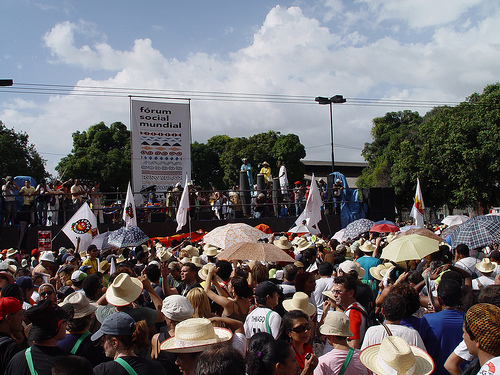 The 2009 World Social Forum (WSF) has started in Belem, Brazil where thousands of people have gathered to discuss, develop strategies and act together against exploitative neo-liberalism and globalization. The WSF, which started in 2001, is an open forum for civil society and non governmental organizations to share experiences, network and formulate advocacy alternatives. Belem, capital city of the State of Para in Brazil and gateway to the Amazon forests, was chosen to highlight the challenges of climate change, environmental issues and rights of indigenous people living in the Amazon tropical forests. Previous meetings for the World Social Forum have taken place in Brazil, India, Caracas and Nairobi. Some members of the Missionary Oblates from around the world have consistently participated in many of these WSF gatherings. This year in Belem, some 35 Oblates are participating. Stay tuned to the Oblate JPIC website for their updates and reflections. For the latest on the WSF 2009 – visit IPS terraviva This website has news, photos and videos in English and Spanish.